I bought a new cycle today. I cannot deal with the rickshaws or three wheel autos having to bargain all the time. So I decided to buy a new bike for my transportation needs. It’s is a little tricky driving on the left-side of the road, but I will get use to the concept. The three hazards are people crossing in front to turn on to the next street, the intersections, and the cow traffic. Other than those hazards, cycling forward flows nicely. Take a look at that nice loud bell. 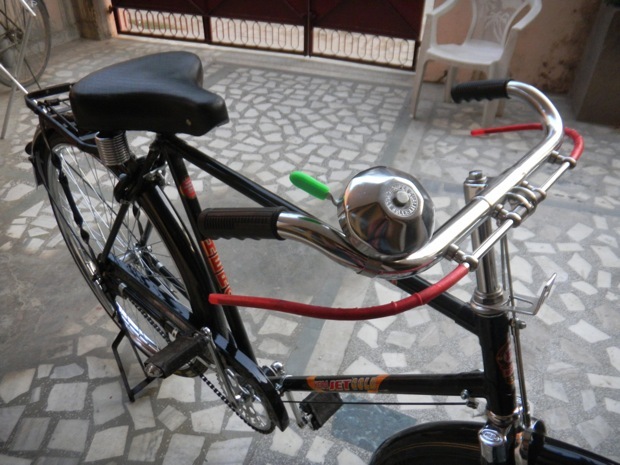 A bell or horn is essential for any type of transportation in India. The family said I am welcomed to stay three months, and I accepted. The situation is perfect. There is a yoga academy a half a block away, I am joining the three day a week program for one month, then i can decide if I want to attended six days a week the next month. I am only eating one hot meal a day which is lunch, and the rest raw food. There are also lots of stuff going on in Varanasi. The price for the yoga is 800 rupees a month for three days, or 1600 a month for six days a week. They also offer a three month certification program. 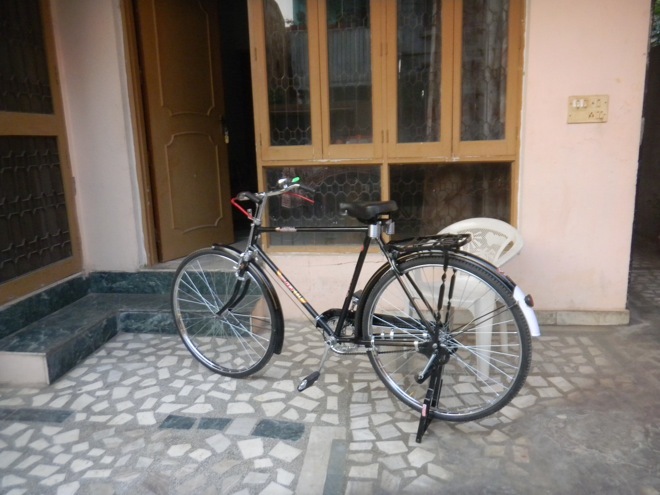 The bicycle was 2850 rupees, however I can resell it for 2000 rupees when I leave. All the cycles come with a built in lock that locks the back tire, a kickstand, a back-rack, and the bell. I will be updating this saga soon, but first yoga in the morning. I just stumbled upon your blog but it sounds really cool and I like your new bike! Hi… came across your site whilst looking for yoga courses in India… loving the travel articles! Looks like you’re really living the dream which is great! Not sure how you’re managing cycling in India – have been there a few times before and think while I loathe rickshaws I’d still prefer them to taking my life into my own hands. The homestay idea is a good one – think I may do the same… would be curious to hear your recommendations once you’ve completed this part of your trip! Enjoy it! Next post: The Streets of Varanasi the Oldest City of India! Previous post: Renting in Varanasi India—The Home of the Ganga.